We invite you to come together with us for Stand with Charlottesville: An Uptown Conversation about race and justice in the Trump-era. RSVP through the link above. Just like dirty air or climate change, hate is an attack on a community’s health that threatens the vitality of our entire society. WE ACT condemns the hate speech and domestic terrorism inflicted on innocent victims in Charlottesville, Virginia by white nationalists, supremacists and members of the KKK. Trump’s well-documented history of bigotry and racism as a candidate, and now as an elected official, has lit the match on a volatile ideology and emerging network of hate groups in this country. What happened in Charlottesville was not just about a Confederate statue, it is about the warped and abhorrent understanding of racial history in the United States that these statues represent. From slavery to Selma, from Standing Rock to Charlottesville—there is only one side of history to be on—the side that stands for equality, diversity, and inclusivity. When hate flares up, we stand in solidarity with each other and people across the country speaking out for love, safety, and peace. 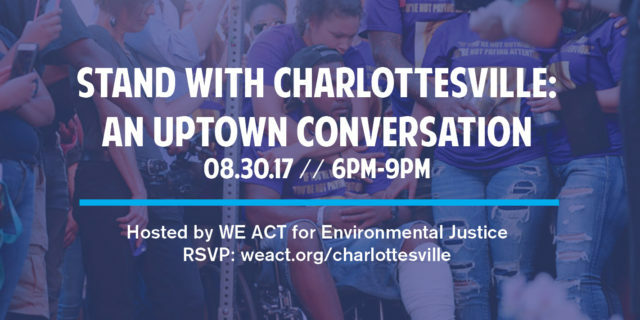 We invite you to come together with us for Stand with Charlottesville: An Uptown Conversation about race and justice in a Trump-era. RSVP through the link above.